HUGS - Piotto et al. 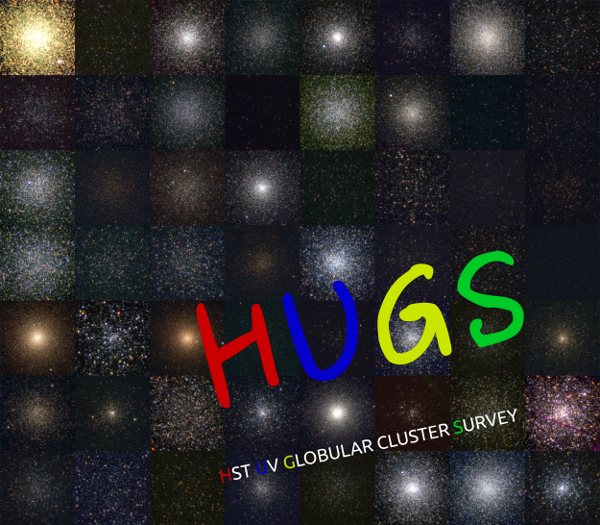 The Large Legacy Treasury Program "The HST Legacy Survey of Galactic Globular Clusters: Shedding UV Light on Their Populations and Formation" (GO-13297, PI: G. Piotto, 131 orbits) is a UV-initiative proposal to complement the existing F606W and F814W database of "An ACS Survey of Galactic Globular Cluster" (GO-10775, PI: A. Sarajedini, 134 orbits) by imaging a large sample of clusters through UV/blue WFC3/UVIS filters F275W, F336W and F438W. Because these three filters are sensitive to C, N, and O abundance variations, they allow us to disentangle and characterize multiple populations in globular clusters. Combination of these UV/blue filters with the optical ones also gives the opportunity to measure the helium content of each population. Our resulting final database contains catalogs and astrometrised stacked images of 56 globular clusters and one open cluster observed during the GO-13297 (PI: Piotto) and the two pilot projects GO-12311 (PI: Piotto) and GO-12605 (PI: Piotto). For each cluster we release 3 catalogs, one for each photometric method adopted. The catalogs contain information on the positions and on the photometry in five bands (F275W, F336W, F438W, F606W, and F814W) of each star found in the cluster field. The catalogs also include membership probability. You can refer to the full collection of HUGS data products using the DOI http://dx.doi.org/10.17909/T9810F. <targ> = target cluster, e.g., "ngc6791"
A mosaic of HUGS clusters.